Brake inspections or repair, we strive never to stop short of excellent service. 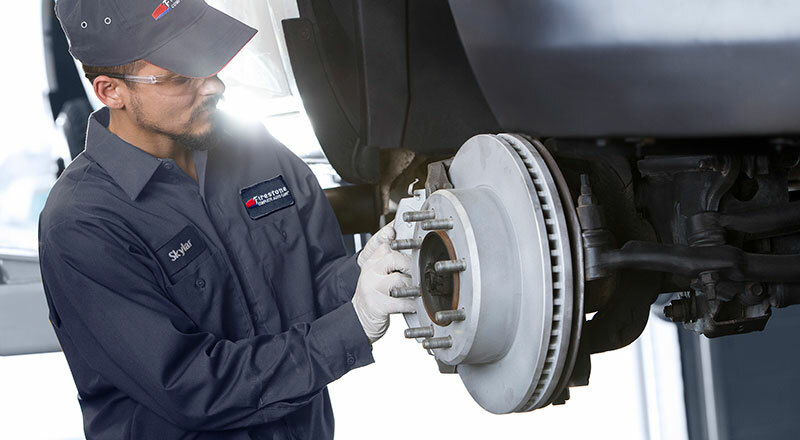 Visit Firestone Complete Auto Care near you for the right brake service in Garland. Do squeaky brakes, a spongy brake pedal, or less stopping power have you searching for brake specialists near you in Garland? Firestone Complete Auto Care is the place to go when you need brakes for less than the other guys. And with our brake coupons, you can spend less on the brake repairs and services you need to keep you safe on the road. But how do you know when it’s the right time to stop by? Watch out for signs! Smells, sounds, and sensations in your steering wheel can all mean you've got braking problems. Screeching noises can point towards worn brake pads and shoes. A burning smell near your tires isn't normal, and is a sign you need a brake inspection. No matter the trouble, your best bet is stop by for a free brake inspection. Otherwise, the damage could spread! Visit your local Firestone Complete Auto Care for a free brake check in Garland, when it's most convenient for your schedule. During your inspection, our technicians will evaluate pad, rotor, and drum wear, on top of checking the health of your brake fluid and e-brake. We'll then discuss any services with you, like brake pad replacement, rotor and drum resurfacing, brake fluid change, or replacement of brake lines. Whether you need new pads or hoses, you'll find that we're one of the best choices for brakes on a budget. We perform nearly one million brake repairs every year! Make sure that when you hit the brakes, you don't hit anything else. Conveniently book an appointment at Firestone Complete Auto Care for brake service in Garland at the first sign of squeaky brakes, low brake fluid, or a loss of stopping power. Most stores are open in the evenings and on weekends to better fit your schedule. Trust our work and trust your brakes. Find your nearest shop and invest in safe driving today! From oil changes to alignments to engine repair, trust your nearest Firestone Complete Auto Care for your car or truck maintenance and repairs. We're your local car care center, tire store, and automotive shop combined into one. Our automotive technicians work hard to help keep your vehicle performing its best. When you need work done on your car or truck, we promise affordable prices and exceptional service. Ready to experience the difference? Book your Garland, Texas auto repair or service today.